Volvo's only. Some models slightly higher. Plus shop supplies, tax, & hazardous disposal fees (if applicable). Price may change without notice. Not to be combined with any other discounts. Present coupons at the time of write-up. Expiration date 4/17/2019. Volvo engineering is unlike anything else on the road. 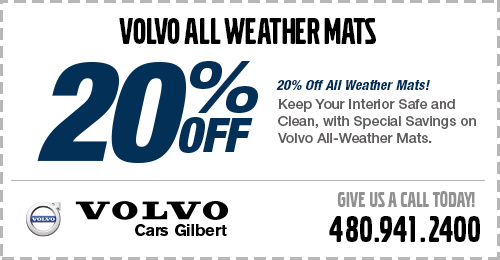 So, when it comes to keeping up with the maintenance, service, and repair of your Volvo, it pays to only trust genuine parts and products from our parts department at Volvo Cars Gilbert. 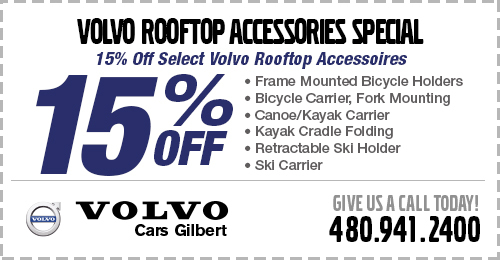 The value that comes with every Volvo runs deep, and we're pleased to offer these updated special offers on genuine and factory-approved parts. Whether it's time for the next oil change or your more experienced Volvo needs repairs, be sure to check the special parts and accessory offers on this page to see how you can get more for your money. Our expert parts professionals will ensure you get the right Volvo parts the first time, and you'll find some of the best factory-certified technicians available in our service center to take care of the work if you prefer.